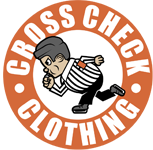 Murph is pleased to have the team at Cross Check Clothing as a returning promotional partner for the 2018/19 hockey season! Cross Check Clothing is an Ice Hockey inspired clothing and merchandise brand bringing fresh and exciting products to the hockey loving world. They are based in the UK but ship worldwide, so wherever you enjoy your hockey, you can also enjoy Cross Check Clothing. Cross Check know how passionate hockey fans are. Like the players on the ice, they wear their colours with pride. Cross Check Clothing is the fresh original brand that all hockey fans can enjoy. They update the store with new items on a regular basis, so please continue to check back as they strive to improve their product range.